What should college and university administrators do when the First Amendment seemingly conflicts with tightly held institutional values? Should administrators block, discourage, or attempt to adjudicate speech because it doesn?t agree with their belief systems or institutional mission statements? This reader-friendly handbook addresses the responsibilities of administrators to balance protecting the rights of many different parties while maintaining a campus atmosphere conducive to learning. 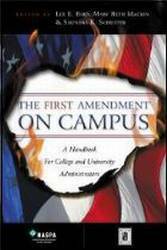 It offers practical advice and strategies for dealing with myriad First Amendment issues based on previous court cases and the experiences of administrators and campus hearing officers who have lived to tell about it.